Source: Galley courtesy of Kaye Publicity and Berkley-Penguin. Thank you! As a girl, Genevieve Martin spent the happiest summer of her life in Paris, learning the delicate art of locksmithing at her uncle’s side. But since then, living back in the States, she has become more private, more an observer of life rather than an active participant. She has held herself back from those around her, including her soon-to-be-ex-husband. But Paris never really left Genevieve, and, as her marriage crumbles, she finds herself faced with an incredible opportunity: return to the magical city of her youth to take over her late uncle’s shop. But as she absorbs all that Parisian culture has to offer, she realizes the city also holds secrets about her family that could change her forever…and that locked doors can protect you or imprison you, depending on which side of them you stand. 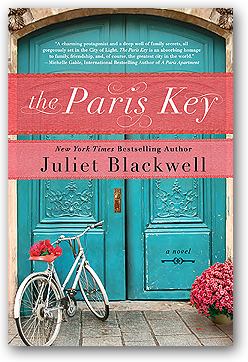 Juliet Blackwell’s The Paris Key is a savory read. During my reading, I was taken in by the sensory experience of the novel: the rich and mouthwatering descriptions of food; the attention paid to taste and smell; how the protagonist works and feels with her hands, and how she reacts emotionally and physically to people and situations. In addition to its sensory nature, The Paris Key promises character discovery and life-altering reveals and works patiently through them. Genevieve, the main character, is introduced to us while her marriage is in the throes of fallout. But we soon learn her marriage is just the top of a mountain of deep-rooted anxieties and dissatisfaction: as we come to know her more intimately in flashbacks and the present, we learn about ghosts, her isolation, her continual pain from losing her mom as a teenager, and hazy memories of her parents’ relationship. Alternating between Genevieve’s present time in Paris and her time in Paris as a teen, the third point of view we are given is that of a young adult Angela Martin- Genevieve’s enigmatic mom. While Genevieve’s life in Paris slowly and cautiously begins to flourish (I loved these sections- so lush), the story turns darker and more complicated. Mostly through Angela’s point of view- which is uncertain and cloudy in essence- there is the exploration horrifying world events, of atrocities committed in France and other nations, and the story of a strange, fierce and precipitous love. I was initially surprised and quite wary of how so much would mesh together: how could a story so abundant with finer points of French architecture, design and cuisine could handle such heavy and grand topics. I do have some qualms about the shifts in tone and transition that occur as a result of bursts of historical examination, but it is intriguing and unexpected that the author chose this approach! Overall, The Paris Key is a good story and one that I had a hard time putting down! It is read that touches upon heartbreaking choices, tragic historical events but it doesn’t read as brooding or hopeless. Contemplative and thoughtful, the novel is a quiet and lovely read; rich with Parisian detail, and mouthwatering. Readers who enjoy the writing of Erica Bauermeister (The School of Essential Ingredients), Molly Wizenberg, novels about Paris or French gastronomy (with some historical bent) or films such as Julie & Julia and Under the Tuscan Sun might especially enjoy this title. I received a copy of this title in exchange for an honest review. All opinions and comments are my own.